The main focus of our division is design and realization of the R3B experiment at FAIR. The goal is to develop and construct a versatile reaction setup with high efficiency, large acceptance, and high resolution for kinematically complete measurements of reactions with high-energy radioactive beams. This work is performed within the R3B Project Group. The planned setup is shown on the figure below. 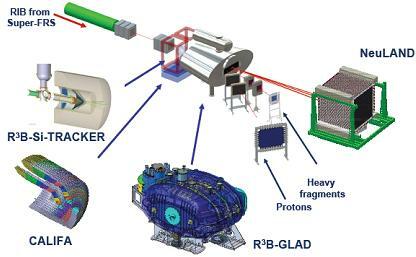 R3B experimental set-up in the phase I. In the phase II, the high-resolution spectrometer will be included. Profiting from the experience and work dedicated to the developements of the R3B experimental setup we also contribute to several other projects: ELISe, EXL, Super-FRS and Young Investigators Groups. The work performed in our division is done in collaboration with groups from different institutes and universities, as it can be seen in: Collaborations, Co-operation and EMMI.